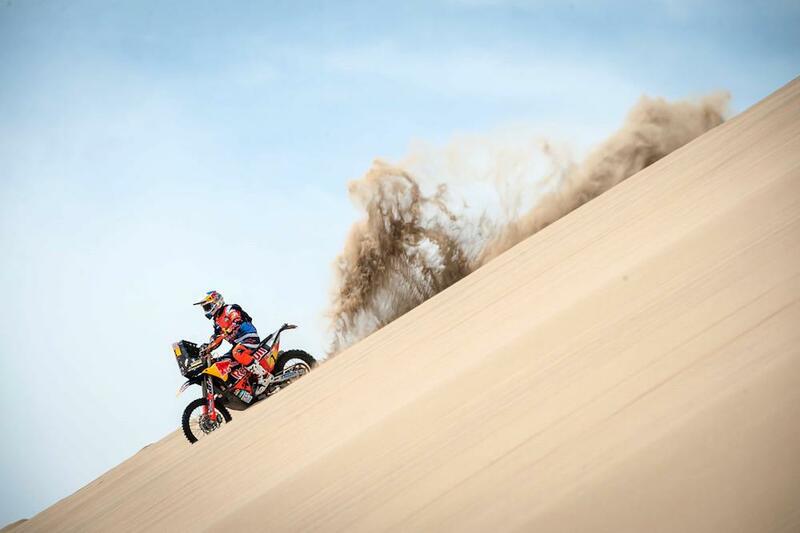 Factory KTM rider and reigning Dakar champion Sam Sunderland picked up where he left off in 2017 to win the opening stage of Dakar 2018. The 28 year old Brit stormed the opening 31km prologue to win by a not insignificant 32 seconds finishing in a time of 20m 56s. Second position was Yamaha man Adrien Van Beveren, with reigning FIM Cross Country champion and Husqvarna rider Pablo Quintanilla third. Honda’s no.1 man Joan Barreda set the fourth fastest time making it four different manufacturers at the top of the classification. Speaking to MCN, Sunderland said: “Its day one of Dakar, there’s a buzz in the air and a lot of excitement going around. To be honest I planned to take it safe because I know that it can be difficult to see some of the drops, especially at midday when I started because the sun is high in the sky. Fellow Brits Max Hunt and Lyndon Poskitt both enjoyed a positive opening day. Hunt riding the HT Husqvarna finished with a time of 29 minutes 56 seconds which made him 66th fastest. He said: “It was so good to finally start because I was pretty excited to get going. I was a bit apprehensive about the dunes here in Peru, people warned me about how big and steep they were but so far so good. Poskitt who has had to overcome a few dramas to even make day one including fighting off a chest infection and having to pay $1200 to get his rear shock released from customs finished the in stage in 30 minutes 46 seconds placing him 70th overall. Keep up with MCN's man on the ground in Dakar on twitter by clicking here.